Many writers and other literary types have been concerned as of late with the idea of queering science fiction, fantasy, and other kinds of speculative fiction, which have an unfortunate but not entirely undeserved reputation of glorifying certain kinds of white homophobic masculinity. 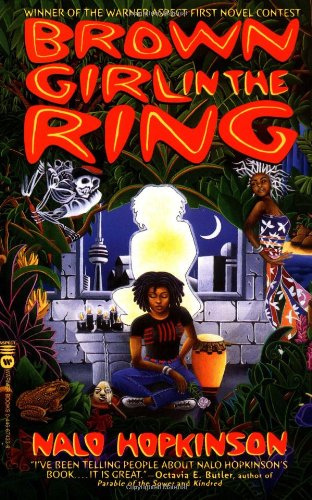 Being a fairly recent convert to these kinds of non-realist writing, I picked up Jamaican-born Torontonian Nalo Hopkinson’s first novel Brown Girl in the Ring (1998) eagerly. It comes recommended by Octavia Butler, who is my favourite SF/fantasy writer. I was also excited about this novel because it had been one of the contenders in the Canada Reads 2008 contest, although it wasn’t the winner—King Leary by Paul Quarrington was, and while I’m sure it’s a great novel, it’s about an aging hockey hero, and stories about old white straight dudes don’t really need any more publicity than they already have. The universe of Brown Girl in the Ring is unique and captivating: the city of Toronto has been barricaded and abandoned by the privileged and those who couldn’t or wouldn’t leave are left to construct a new kind of post-capitalist society in the inner city. As a former librarian explains in the first chapter, the collapse can be traced back to a First Nations land claim lawsuit and a related trade embargo; Toronto slowly became a jobless, crime-ridden, lawless place, with the army eventually moving in to occupy and then deserting the war zone. In other words: Ontario’s (not to mention Canada’s) imperialist history (and present) finally catch up to them. This dystopian future scenario, probably familiar to any SF readers out there, is cleverly intertwined with Afro-Caribbean magical, mythical, and spiritual systems with which Hopkinson is clearly intimately familiar. In the book, most of the inhabitants left in Toronto are recent immigrants to Canada, many of them originating from the Caribbean, so this melange is particularly appropriate. Struggling to survive in this strange world is Ti-Jeanne, a young woman with a new baby, living with her grandmother in what used to be the farmhouse at Riverdale Farm—one of the neatthings about the book is imagining a place so familiar, like this tourist attraction historical park, as something utterly other than what it is. It makes the familiar momentarily unfamiliar. Ti-Jeanne’s grandmother is a fascinating character: an herbalist, spiritual leader, and healer with mountains of knowledge, she is a tough-love, rough around the edges kind of woman that Ti-Jeanne loves, admires, and is afraid of. I really appreciated the feminist politics of the novel, Ti-Jeanne looking backwards to her mother and grandmother as sources of strength and wisdom. The twists and turns of the plot are well-crafted, perhaps a bit too neatly: the slowly revealed previously unknown connections between the characters feel a bit contrived, but this is Hopkinson’s first effort at a novel after all. Ti-Jeanne both runs from and toward Tony, the father of her baby, and they, along with her grandmother, become entangled in the nasty business of Rudy, the voodoo mob boss unofficially in charge of Toronto who is truly terrifying. In the midst of all this real-life action, Ti-Jeanne is learning that she has the same kind of seer gift her mother had—the gift that eventually destroyed her. Having heard of Hopkinson as a queer writer, I was a little surprised that the main character of Brown Girl in the Ring wasn’t queer; but of course, queer writers don’t have to always write from a queer perspective or about queer characters. There is an important side character who is a self-serving lesbian politician (see, queers can be evil just like everyone else!) and Ti-Jeanne foresees the death of a tough-acting street gang member who is killed defending his lover who is a trans woman. So queers are definitely around, even if they’re not the main focus of the novel. What was a bigger drawback for me was that I felt Brown Girl in the Ring could have used some more fastidious editing. The epigraphs beginning each chapter and often sub-sections of chapters were overdone and didn’t add much to my reading of the novel. These sub-sections in themselves didn’t seem very well thought-out, and I sometimes wondered why certain chapters were so choppily divided up; the divisions interrupted the flow of the narrative. Some of the language, particularly certain expressions Hopkinson uses, was repetitive, which was also distracting. These formal complaints aside, which I think can largely be chalked up to the fact that this was Hopkinson’s first novel, Brown Girl in the Ring is quite an exciting read. In this kind of universe, even death doesn’t necessarily mean, well, death, a fact that can really keep you on the edge of your seat—and I don’t use that cliché lightly. 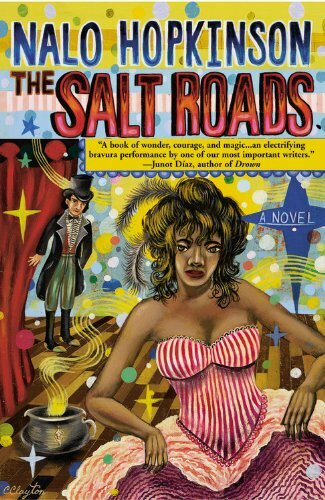 I’m looking forward to reading Hopkinson’s newer works, The New Moon’s Arms and The Salt Roads, which has a pretty rad cover. 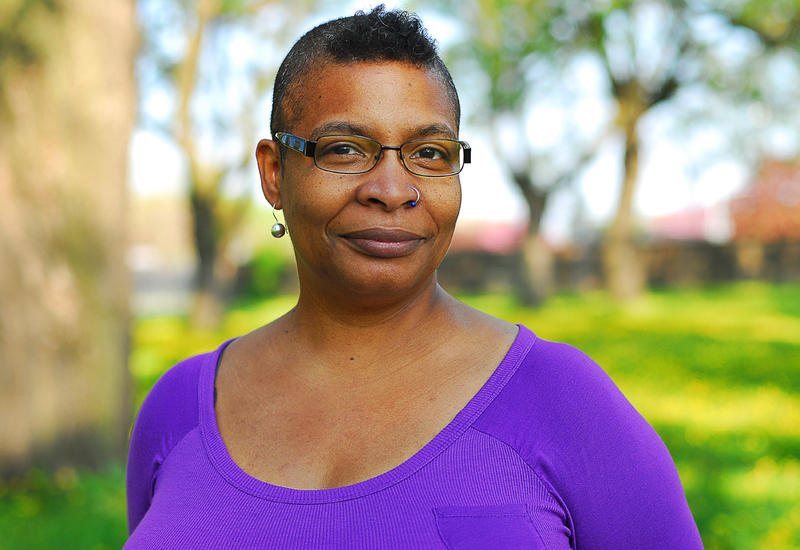 One last note: Nalo Hopkinson is doing a reading in less than a week as part of this year’s Toronto’s Pride reading series; I live too far away to go, but you—i.e., if you live near or in Southern Ontario—should! More news on Toronto Pride’s Proud Voices and other literary-related Canadian Pride events soon! (Update: Hopkinson just posted on her website that she’s withdrawn from the reading because of some “poorly handled labour issues” connected with the bookstore that she doesn’t want to support; she doesn’t give any more information than that, which is a bit frustrating, so I’ll see if I can find out more. She is reading tonight at the Parkdale Library in Toronto, though!). This entry was posted in Black, Canadian, Caribbean, Fiction, Nalo Hopkinson, Postcolonial, Queer, Science Fiction and tagged Book Review, books, Canada Reads, Canadian Fiction, Caribbean Fiction, Hachette Book Group, literature, queer authors, Science Fiction. Bookmark the permalink.